This entry was posted on Wednesday, April 23rd, 2014 at 2:08 pm	and is filed under Beatle Photos. You can follow any responses to this entry through the RSS 2.0 feed. You can leave a response, or trackback from your own site. He kind of had that Bill Wyman thing going on here. BTW, I’m wondering… is that an ES-5 he’s playing in the top photo? Pretty rare nowadays. Last manufactured in ’62. Looks like a beauty. Mr Horse may be able to answer if he grazes over this way, I have a question or two I need to post for him as well. Yes, Michael. That is an ES-5 Switchmaster with the Venetian cutaway and P-90s rather than humbuckers. It is the 1950s Chuck Berry and Scotty Moore guitar so maybe Harrison was taking advantage of the availability of the model in the US while in Los Angeles. The guitar added to his arsenal at Kinfauns and later Friar Park. I am sorry, my mistake. The Chuck Berry guitar was an ES-350T. And Scotty Moore played an L5 CES, similar to the ES-5 but with only two P-90s. The guitar seems to be pre-1955 vintage. 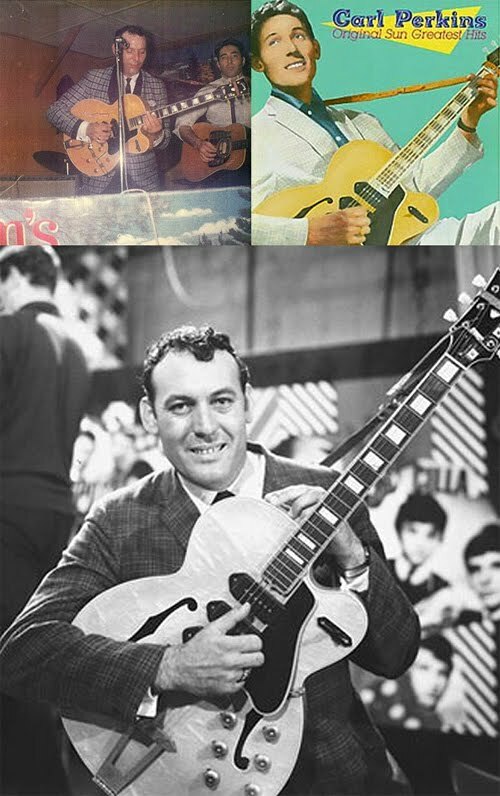 It was Carl Perkins who used an ES-5. Many thanks, Mr. Horse. It sure looks like a beauty. With those 3 P-90s it must sound as good as it looks! You people know so much it makes me kinda sad to realize at almost 63 I probably don’t have enough time on this planet to learn all this stuff… I’ll remain a semi-ignorant Beatle fan! Of course when I finish my book and can read Mark L.’s book, I will be in a much better place as far as Beatle knowledge is concerned – can’t wait! (For those who haven’t read something I posted a while ago: my self-imposed torture is that I am not allowed to read it until I finish my own book… I have to confess Miss Bravo has been seen lurking inside large bookstores in Rio de Janeiro flipping through the pages or just holding the book…). Lizzie, are you kidding?! You know what it’s like to stand next to a Beatle, get the autograph of a Beatle. My God, you even got to sing on a Beatles record. I’m sure we all would love to have had those experiences. Everyone should be such a “semi-ignorant” Beatle fan! You rock Lizzie. It’s a privilege to be able to write this and know that you’ll see it. Can’t wait for he book! Cheers!